The girls have been asking, begging, pleading with me to have a girls tea party. They have big ideas and long guest lists. At first it seemed exciting but the more they talked the more I became nervous and concerned that this would be a big task to undertake. I gracefully avoided the discussion of setting a time and date for the party long enough. It is time to get serious. For the past week I have been on the search for party wares. We have no tea set in this house. 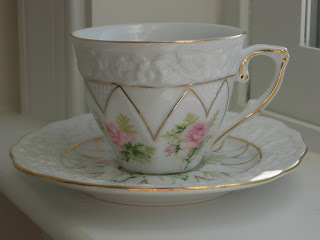 So how can you have a tea party without the all important tea cup? I found some, six cups and saucers, and they are perfect. When I showed the girls the tea cups I found thrifting they nearly lost their minds. By the way they reacted you would have sworn I filled the cups with candies and money. Immediately they went to creating their invitations and setting the guest list in order. I initially thought I'd do a duo party where both girls invite 2 other girls and that would make six guests. However I sobered up from whatever sauce I was sipping and realized that was a foolish idea. If we invite just the neighbor girls, who are let's be honest, their dearest friends, then we'd have 5 girls and if you count little brother then 6. So the thought is I do a test run this weekend with the neighbor girls and then at least the eagerness will subside until I can work out the details for their classmates to come over for tea. Actually, so that the three of us can work out the details for the party. I'm making sure that they take part in this planning so that they too can see how the process of entertaining can require several days worth of work.